While this is a painting blog, and Valérie Blass is primarily a sculptor, I was taken by this watercolour and digital print combo that was part of an exhibition surveying the artist's work over the last decade. I first saw La Partie Pour La Chose at Hole Gallery in New York over five years ago and was taken by the odd comedy of its jarring juxtapositions: intertwined rope and novelty masks rendered in colour before a grisaille background with two shadowy, hooded figures emerging from it. 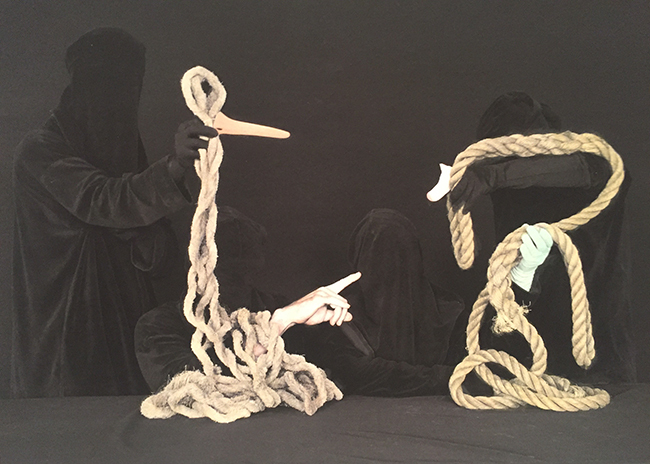 There are shades of Baldessari and Salle both in terms of its humour and the formal technique of placing colour highlights against black-and white backdrop imagery that appears filmic for its implied narratives.